We have already learned the basic concepts of vectors. 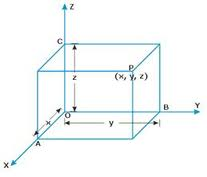 In this topic we will use the concepts of vector algebra to the three dimensional geometry. In the three dimensional geometry, we deal with direction cosines, direction ratios, equations of line in space, equation of plane in space etc. 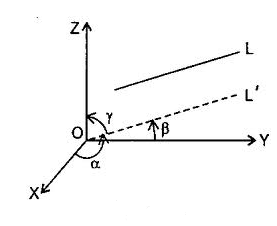 cosα, cosβ and cosγ are called direction cosines of the directed line L’. Any three numbers which are proportional to the direction cosines of a line are called direction ratios of the line. If l, m and n are direction cosines abd a, b and c are direction ratios of a line then a=λl, b=λm and c=λn. Example: Find the direction cosines of a line which makes equal angles with the coordinate axes.